Monkey, Pig and Friar Sand — The Metal Man, The Mother of Wood and The Yellow Wife. Taoist alchemy is a doctrine about the creation of the Golden Elixir or the Pill of Immortality. The aim is to reach transcendence and immortality. 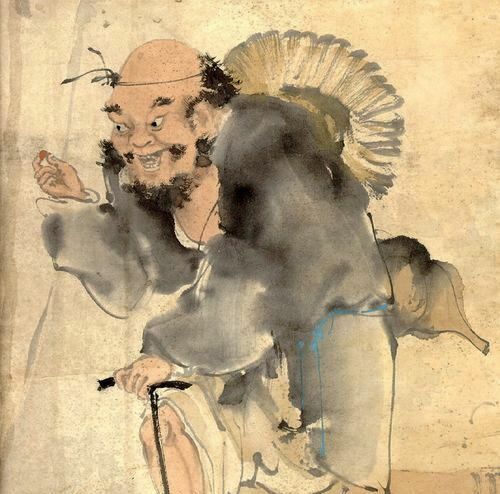 Taoist alchemy is divided into external and internal alchemy. External alchemy uses a physical crucible and ingredients, while in internal alchemy, the crucible and medicinal ingredients are symbols and the creation of the elixir is metaphysical process. with the pill of immortality. Ancient immortals used the term Golden Pill (Elixir) as a metaphor of the essence of true consciousness, which is fundamentally complete and illumined. The ignorant who do not know this consider the golden elixir to be a potion made from minerals. All esoteric traditions speak about an Elixir of Immortality, which has many other names such as Elixir of Life, Water of Life, Amrita, Ambrosia, Soma or Panacea. It refers to a method to reach the state of Divine Presence of the Higher Self or Original Spirit. When esoteric traditions no longer produce immortals or sages, the understanding of this method gets lost, and a religion develops where people perform external rituals and try to do something that can only be done internally. When the knowledge of the method of doing is no longer understood, people have no choice but to take the outer medicine as a physical substance. After Monkey was invited to Heaven, he stole the peaches of immortality, got drunk and stole Lao Tzu`s pill`s of the elixir of immortality. 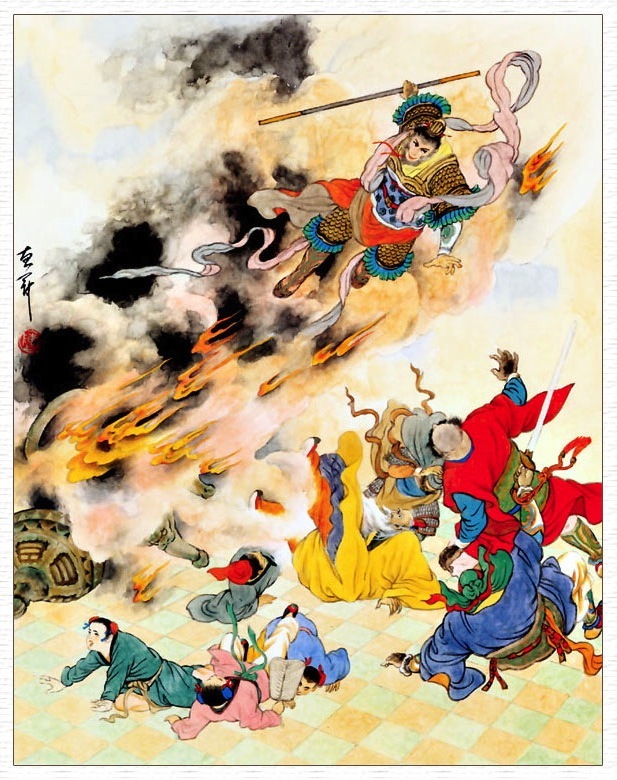 The jade Emperor ordered Monkey to be captured and it was decided to put the Great Sage in Lao Zi`s Eight Trigrams Furnace, to refine out the elixir of the immortal pills that he had stolen and reduce him to ashes at the same time. Because Monkey represents the element Fire, he was unharmed by the Eight Trigrams Furnace. The Eight Trigram Furnace is a Taoist symbol. The furnace symbolizes the method for creating the Golden Elixir (Pill) through the Firing Process. The firing process spoken of in the alchemical classics and writings of the masters is a metaphor for the order of practical spiritual work. Each of the eight trigrams is made up of Yang (———) and Yin (— —) lines. Yang stands for the mind of Tao and Yin stands for the human mind. The firmness of the Tao belongs to yang; this is the great. The flexibility of the human mind belongs to yin; this is the small. If the human mind lacks the mind of Tao, it can defeat the Tao by using consciousness to produce illusion. If you govern it by the mind of Tao, the conscious light is clear and can thereby help the Tao. The point where one yang begins to move is when the yang light of real knowledge of the mind of Tao stirs but is not yet very active: only then is a glimpse of the root of heaven revealed. At this time you should quickly set about increasing the fire, gathering yang and putting it into the furnace of evolution, gradually gathering, gradually refining, from vagueness to clarity, from one yang to complete purity of six yangs. This is also like the mid-autumn moon, exceptionally bright, shining through the universe. When the full moon of contemplation is reached, you will be pure. The process of going from one yang to the complete purity of six yangs symbolizes the burning away or rendering passive, of the human mind through the mind of Tao, and reaching the presence of the Original Spirit or Higher Self. 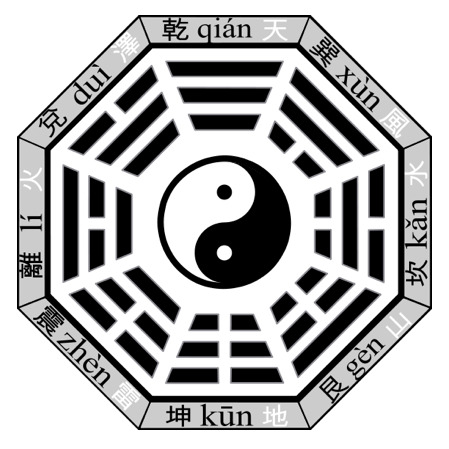 In The Seal of Unity of the three (Triplex Unity) a 2nd century Taoist text, six trigrams are associated with the waxing and waning of the moon. The month is divided into six parts of five days each. Kan (Water) and Li (Fire) symbolize the medicine or ingredients of the Elixir; they are what is being fired and are not part of the firing times. 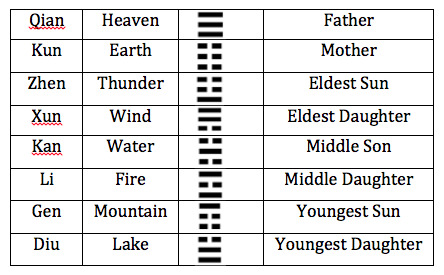 The other six trigrams Qian (Heaven, Kun (Earth), Zhen (Thunder), Sun (Wind), Dui (Lake) and Gen (Mountain) describe the stages of waxing and waning of the moon. They symbolize the firing times of the elixir within the body. 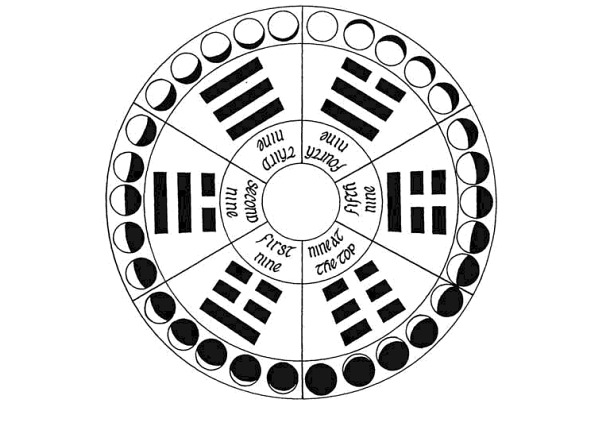 The six trigrams associated with the 30-day moon cycle according to Triplex Unity. Each trigram represents "one Nine"
Each of the six stages of the waxing and waning of the moon is associated with a Yang line of the hexagram Qian (Heaven) representing the gradual change of Yin into Yang. Each Yang line is also represented by the number Nine and by a Dragon. The six lines of the Heaven hexagram act as an image of the waxing and waning of the moon`s body. But it`s all metaphor. Those who try to learn without proper understanding the meaning behind this rhyme (see below) will have great trouble reading it. and the Yang Breath makes it start. On the eighth, Lake is in action. 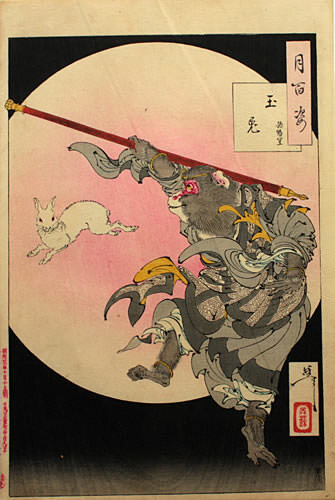 “Nine in the second place, appearing dragon”. On the fifteenth the body of Heaven is achieved. fearing that he might lose the magic charm. “nine in fourth place, wavering flight”. rules over arrest and advance. “Nine in the fifth place, flying dragon”. “Nine at the top, thriving dragon”. are the compass and square of the Dao. The Yang numbers are now completed. 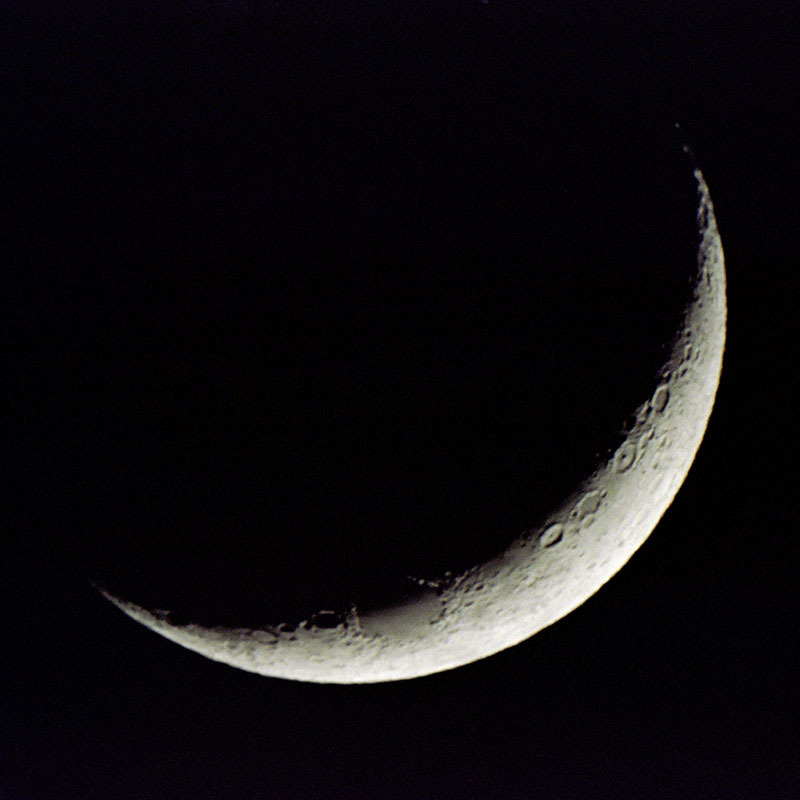 During the firing process, represented by the waxing and waning of the moon, the human mind (yin) is dissolved, and the Original Spirit gradually comes into being. This process is presented as a six-step process, going from one yang (symbolized by the I-Ching hexagram Return) to six yangs (symbolized by the I-Ching hexagram Heaven). On the left the hexagram 'Return', on the right the hexagram 'Heaven" from the I-Ching. The first six oxherding pictures below show the symbolism of the firing process in a different way. The boy represents the mind of Tao while the bull symbolizes the human mind or lower self. When the boy and the ox both disappear, The blue sky is absolutely clear. All is as round as an autumn moon. 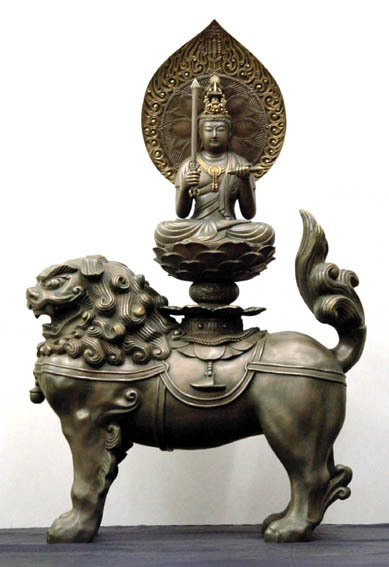 The ox, and also the lion, are symbols for the lower self or human mind. In the Journey to the West, the demons, which are almost always animals, are yin and represent the human mind or the lower self. When the mind of Tao has mastered the human mind, the lower mind no longer interferes and the original spirit can come into being. Now the mind is in order and Nirvana has been won. Pills that can make you immortal are only a fiction. Nirvana can never be won by a mind in disorder. Nirvana means blown out and refers to the lower self under control because the aberrant fire of the lower self has been blown out. This fire from the lower self is different from the fire of the firing process. The fire of the firing process is fire from the mind of Tao and it is symbolized by the waxing of the crescent moon into the full moon. This is like the bright moon in the sky, lightening up the world to view, penetrating darkness. One can then cease to employ effort involving increase and decrease, give up doing and enter non-doing. Now the outer medicine, which is the method of doing has been used and one can relax one`s efforts. 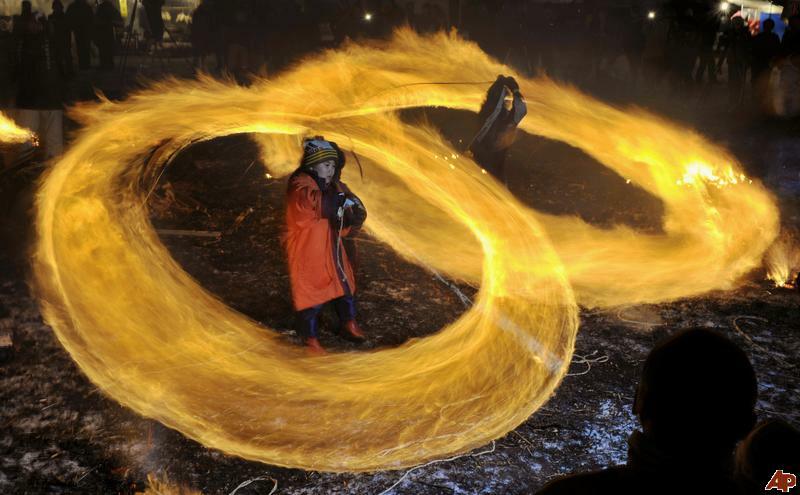 The firing process itself is yang, representing the firmness of the mind of Tao. After one has reached the purity of six yangs one enters non-doing, the inner medicine, which is yin. One is in a simple state of awareness, just watching. This is true yin while the human mind or the yin demons are false yin. The moon waxing to fullness is a secret passed on by word of mouth. The medicinal substances are hard to know, and the firing process is not easy to understand. Students should hasten to find a genuine teacher.